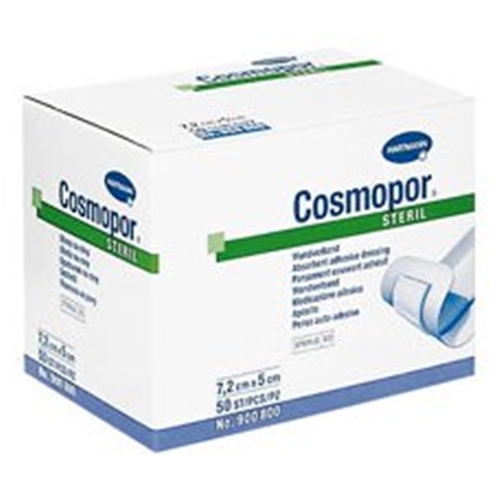 Cosmopor Steril Adhesive Dressing from HealthyKin.com provides a sterile wound contact layer that is air and water permeable, 100% cotton and non-adherent. This pad performs well to absorb exudate for a cleaner wound bed. The non-woven flexible adhesive cover of the Cosmopor pad has rounded edges to prevent the dressing from becoming detached even after being worn for prolonged periods of time. The wide adhesive border is coated with a strong, non-sensitizing polyacrylate adhesive that is well tolerated by the skin and stays secure through post-application damp conditions such as sweat or light rain. The dressing protects the skin and wound area from harmful contamination and trauma. I use these on my 92 yr. old Mom - these do not stick to the wound and do not tear the fragile skin of the elderly. I highlly recommend these to anyone - and I can tell you this - you can not beat their prices for their products. I am a loyal customer from this day forward. I've had skin cancer for over 45 years. So,I developed a sensitivity to latex dressings, even to some that claimed they were latex-free. However, the Cosmopore Adhesive dressing has never caused any rashes. It is my go-to bandage! these dressings/bandages stick where you put them and not to the wound. great prices and delivery time. I am very pleased with the product and delighted with the speedy delivery. These are great dressings. My skin usually tears easily and these do not cause any damage. They also adhere very well with no gaps. My surgeon originally used one, and I got the packaging from him so that I could order. Will order more.